Former BJP ministers Yashwant Sinha and Arun Shourie said on Wednesday the Rafale jet deal was “unilaterally” finalised by Prime Minister Narendra Modi by violating mandatory procedures. They said this defence scandal was “larger than any thus far”. Addressing the media along with the former NDA ministers, activist-lawyer Prashant Bhushan said the manner in which the order for Rafale jets was changed made for a “clear case of criminal misconduct”. Besides the “gross violation of mandatory procedures,” he said, a public sector undertaking was “inexplicably dropped” from the project. Demanding a time-bound probe by the Comptroller and Auditor General (CAG) of India, they asked the government to come clean on the issue. “If the Modi government had stuck to the old deal (negotiated by the UPA government), we could have already got 18 aircraft in flyaway condition and production would have started on the rest of 108 in India. But a new deal of 36 aircraft was finalized without due procedure. 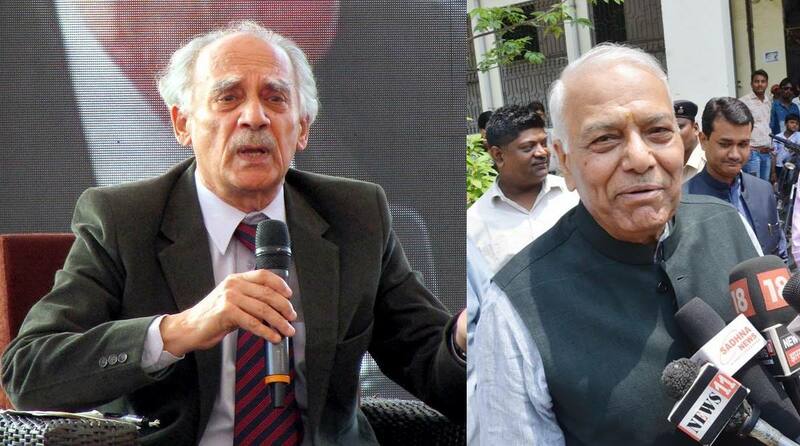 Ye raat ko ilhaam kahan se aaya (When did this divine revelation come)?” Shourie asked. Bhushan said the government was avoiding revealing the cost of each jet citing a secret clause that in fact did not pertain to prices. As per the prices revealed by Dassault Aviation, he said, the final cost of each aircraft along with weapons, equipment and technology transfer was more than double the rate finalised in the previous deal. Sinha pointed out that the Cabinet Committee on Security (CCS) should have vetted and cleared the deal first, but it was “nowhere in the picture” when Modi signed the deal in April 2016. He said the CCS was seized of the matter around one year after the deal had been signed. “The CAG should complete the forensic audit of the deal within three months and place its report in the public domain. We cannot hinge our hopes on Joint Parliamentary Committee (JPC) as the present Lok Sabha is on its last legs and JPC cannot take it up now,” Sinha said. Asked if they would move the court on this, Bhushan replied in the negative, citing the “judicial climate” among other reasons.